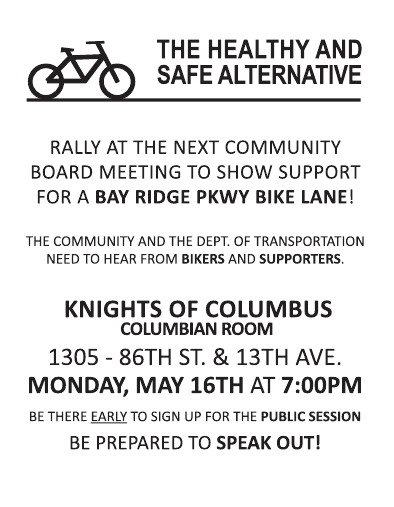 Community Board 10’s Traffic and Transportation Committee…member Bob Cassara put forward a motion to call on the Department of Transportation to paint a “shared route” along the wide stretch of the parkway between Shore Road and Bay Parkway in Bensonhurst — a lesser category of bike lane than a full-fledged path. It’s certainly not as safe as a class 2 bike lane, but sharrows are better than nothing and may lay the groundwork for true safety improvements on this stretch of road. The meeting could really benefit from local, rational voices who can speak up in support of this project. Those Queens lard buttums who hate bikes need to be motored to the turd hole. This is why Obamacare was needed, to force them to bike for their own good and then to psychiatrically regulate the preachers and teachers that produced such creatures. Those birds in Bayside need to be psychiatrically tested for their driver license so they will lose their cars and so move out of town and stop voting for teabaggers.